George Russell, a composer, longtime teacher at the New England Conservatory, and theoretician whose ideas created the foundation for such seminal jazz works as Miles Daviss Kind of Blue and John Coltranes A Love Supreme, died Monday in Boston of complications from Alzheimers, according to the Associated Press. He was 86. Considered one of the most creative innovators and profound thinkers in the history of jazz, Mr. Russell wrote Lydian Chromatic Concept of Tonal Organization in 1953. The treatise, esoteric in title and ground-shifting in effect, eventually transformed the manner many jazz musicians approached their work. Before Lydian, jazz soloists worked primarily under a framework of progressive chords, weaving their improvisations around and through a repeated chordal theme. The effect could be constricting. Abandoning Western musics traditional use of major and minor keys, Mr. Russell argued for development of jazz around modes, or scales. Staying within one scale and reducing complex chord changes offered the musician more freedom to explore the melody of the piece. The genesis of the theory lay in his early friendship with Davis. The germination, however, would come as he lay near death in a sanitarium. "He had a piano at his place, Mr. Russell, recalling his time with the trumpeter, told Globe critic Bob Blumenthal in 1999. Whenever we could we would go there and show each other new chords. I asked Miles what his aim was once, and he said, to learn all of the changes. Somehow, that idea never went away." Mr. Russell, who had contracted tuberculosis while growing up, then suffered a serious relapse. While recuperating, he started ruminating about Daviss ambition. For much of the rest of his career, Mr. Russell would introduce the theory, based on ancient Greek and medieval modes (Lydian refers to the ancient kingdom of Lydia in Anatolia), into other genres of music. A composer of note himself, he wrote such influential pieces as Cubana Be/Cubana Bop, a song for Dizzy Gillespie that was one of the first to fuse Latin and bebop, and All About Rosie, a work in three movements that was commissioned by Brandeis University in 1957 and that featured a young pianist named Bill Evans. At the New England Conservatory since the late 1960s, he explored the possibilities of modal jazz, layered polyrhythms, and other genre-bending and ethnic-fusing possibilities with his students. Those students  in solos, three-piece combos, full orchestras, and many gatherings in between  were often the first to debut the music of Mr. Russell. A native of Cincinnati, young George Russell sang in the choir of the African Methodist Episcopal Church and grew up with dreams of being a jazz drummer. After attending Wilberforce University in Ohio, he left in 1943 to play with jazz great Benny Carter. "Then I heard Max Roach at the Apollo that summer, and really became dejected, he told the Globe. Hearing a perfect drummer made me realize that I couldnt be one; and a couple of days later, Benny called me in and said, 'Im sorry, George, but I have to give you your notice.' He had hired Max." The end of his drumming career was the beginning of his work as a composer. "It gave me a kick in the pants to do what I had been thinking about, which was writing music, he said. Roach introduced Russell to the 52d Street scene in Manhattan, where he heard Roach play with Charlie Parker nightly, and he became a regular in the 55th street apartment of arranger Gil Evans. "Max also introduced me to Diz, Mr. Russell said, who had an idea for a new tune. 'I met these Cuban musicians, he said, and I want to combine what they do with my music.'" The result was Cubana Be/Cubana Bop." "I was influenced by these people, and wanted the same fire and thirst for newness, he said of his early experiences. But I wanted to be me, to establish my own identity. And then I met a young trumpet player named Miles Davis." For the recording sessions, Davis created modal sketches and invited members of his band  including Evans and Coltrane  to explore the embedded melodies. Four of the five tracks were recorded on the first take. The album became the top-selling jazz album of all-time. Modal jazz, Davis told jazz writer Nat Hentoff, gives you a lot more freedom and space to hear things. When you go this way, you can go on forever. You dont have to worry about changes and you can do more with the [melody] line. It becomes a challenge to see how melodically innovative you can be." The use of modals was later expanded by such jazz musicians as pianist Herbie Hancock and can be heard in many diverse settings, from the theme track of The Simpsons to songs by U2 to extended solos by Frank Zappa. With his own compositions, Mr. Russell explored electronica, ethnic traditions, and extended forms, using the Lydian theory to bridge the disparate approaches. 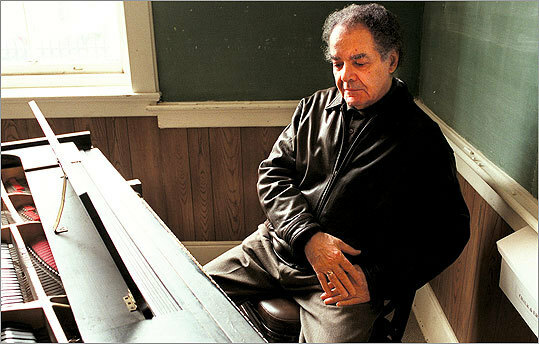 After abandoning drumming, he had learned to play the piano and led a series of groups in the 1950s whose musicians include Evans, saxophonist Coltrane, trumpeter Art Farmer, and drummer Paul Motian, Several albums, including Ezz-thetics, Stratusphunk, and Jazz in the Space Age were influential in the early 1960s. A lack of recognition and job opportunities, however, prompted Mr. Russell to move to Scandinavia in the mid-1960s. He returned in 1969 at the invitation of an old friend, Gunther Schuller, president of the New England Conservatory. Schuller wanted him to teach the modal theory at the conservatorys new jazz department. Mr. Russell, a longtime resident of Jamaica Plain, received many honors. He received the MacArthur Foundation genius grant in 1989 and two Guggenheim fellowships. He was named an American Jazz Master by the National Endowment for the Arts and was elected a foreign member of the Royal Swedish Academy. When not teaching or composing, he performed many of his pieces around the world with his Living Time Orchestra. At the heart of his work, however layered with rhythms or punctuated with electronic blasts, was his love of the blues and gospel. Thats from my days as a kid, he said in the 1999 Globe story, laying on my stomach outside the local Holy Roller church and watching those people work themselves into trances." According to the Associated Press, Mr. Russell leaves his wife, his son, and three grandchildren. A memorial service is being planned.